Composed by Julia Proleiko. Post-Romantic, Etudes and Exercises, Repertoire, General Instructional, Technique Training. 3 pages. Published by Fox Park Music (S0.362773). This was written mostly to give my students a fun left hand technique practice piece in jumping the octave to root triads (A sections) as well as use of finger pedaling (B sections). 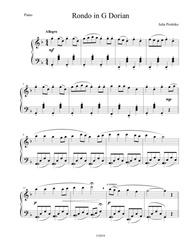 It is written in G Dorian and harmonically influenced by Bartok.